Author bio: Moosa Adam works at 1 Click Bathrooms, the UK's online one-stop shop that helps homeowners build their dream bathroom piece by piece. Revolutionary tech solutions have changed the face of domestic living, offering smart home solutions that make life more convenient and our homes more efficient. The bathroom, as this post will explain, is not exempt from the home tech shake-up. In fact, some of the most exciting smart tech solutions are designed for the bathroom and offer high-tech luxury bathing, increased connectivity and productivity, or even water and energy efficiency. The bathroom doesn’t have to be a place where technology fears to tread. Thanks to waterproof TVs, you can now relax with your favorite TV series while you soak—a much less risky option compared to balancing a laptop on the edge of a bathtub or holding expensive phones or tablets over the water with slippery fingers. There’s always the added bonus that if your television is connected to larger home automation and security system, like Control4, then the screen could become a viewport or control method for managing and monitoring the rest of your home, ensuring that you always know what’s going on even while you’re unwinding. Smart mirrors are at the forefront of bathroom technology trends in 2018. They are capable of everything from smart sensors that engage automated and adjustable vanity lighting to voice-activated video features and weather forecasting. Imagine revolutionizing your daily routine with a smart mirror interface that lets you manage email, check social media, or watch health and beauty vlogs while you get ready or enjoy your self-care routines. Automated faucets and showers can personalize and automate your bathing routine with facial recognition. Enjoy the perfect temperature every time you bathe or prevent children from scalding themselves. They can even be set to diffuse your favorite essential oil fragrance and play your favorite playlist. These comforts, combined with that of a warmed towel off a heated towel rail, you’ll never want to leave the bathroom again! Making sure you don’t use too much water or energy heating your home is crucial if low energy bills and environmental conservation are important to you. Smart home technology can help keep track of excessive water use, so you can review and reduce your usage and, by extension, your bills and impact on the planet. Some smart showers even include a function that stops the water after a certain amount of time, helping get you to work on time while reducing water waste. Slightly less exciting, but nonetheless valuable, leak detection sensors are one way to curb water waste while also protecting your home from potentially devastating water damage. Devices like LeakSmart can be placed under or behind sinks, toilets, and cabinets. When water is detected it can shut down the water main to prevent flooding. It’s only a matter of time before this kind of tech is as ubiquitous in bathrooms as it is in the rest of the home, presenting an exciting time for the bathroom design sector. to sample incredible smart-home solutions. 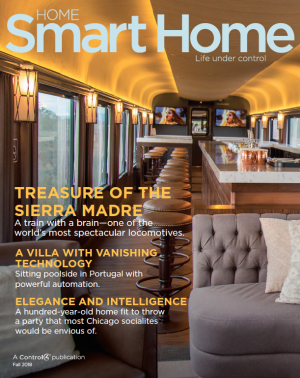 Interested in living the smart life? ​We'll send you more information.